Seeing is fleeting whereas painting is a more lasting, deep exploration into and documentation of the nature of life. I seek to explore the texture of vision, the subtle emotions of color and the harmony or discord in bold composition. 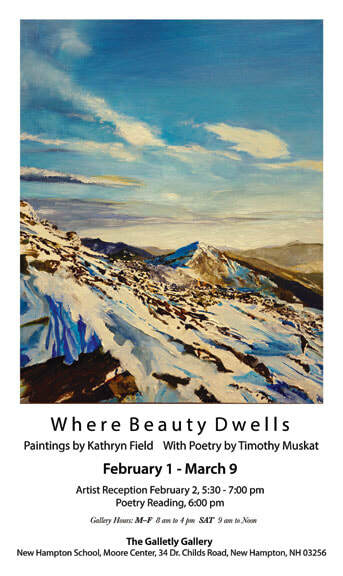 For the past three years, poet Timothy Muskat and I have collaborated on a series of paintings and poems that speak to the unbound beauty found in the White Mountains. Collaborative work requires listening and developing a sense of mutual trust. This process provides a rare opportunity to sit with another and focus on their every word - looking deeply into the place where they are coming from, the feelings they are experiencing, the opportunity to walk in their shoes and see through their eyes. This willingness to make oneself vulnerable to another is invigorating and challenging.